Once you’ve created your project, should you wish you distribute your software to multiple countries, then the question of localisation must, inevitably, arise. 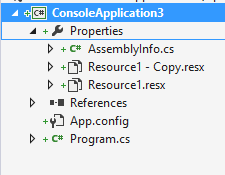 If you’re using .NET then a very tempting option is to use resource files. Most of the plumbing is already done for you, you simply need to create a resource file, and then localise it by copying the file and changing the extension to the correct culture. It’s pretty likely that you’ve already seen that part. You may also have seen the next part too – but my guess is that if you’ve read this long, you haven’t. In the above project, having a resource file and just accessing it seems to make a lot of sense, but what if there’s more than one project; what if you have a solution with a few projects? You could have a resource file for each project, and that works. But, what if you decide to translate to French, but no-one on your team speaks fluent (and it does have to be fluent) French? There are LOTS of companies that will accept a resource file and translate – they’ll also accept several, and translate them all, but why make it so that you need several? If you’ve ever had a look at the resources.designer.cs then this code should look very familiar. That of course is internal, so doesn’t work for this. There are other ways to handle resource strings – you can hold them in the database, in text files, you could build a whole infrastructure of resource assets. If you have a massive solution distributed to hundreds of countries then that’s probably worth it. If not, use what Microsoft give you for free. 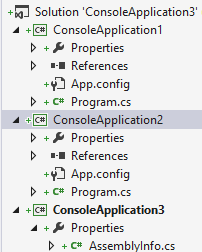 This entry was posted in C# and tagged c#, Localisation on February 28, 2014 by pcmichaels.